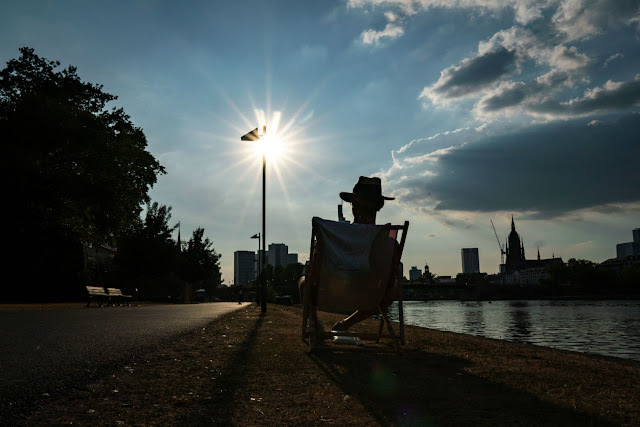 "It cooled down a bit last night - although, 'cooled down' is a bit of an overstatement," a spokesperson for the German Meteorological Office (DWD) told news agency DPA. As climate change continues to impact the environment, scientists have warned that Germany's unusually hot summer could soon become the norm. Hanover airport resumed flights early on Wednesday morning after temporarily shutting down due to damage caused by the heat. Planes landing in the high temperatures damaged several areas on the tarmac, prompting the airport to halt all flights on Tuesday evening. An airport spokesman said 41 departures and 44 arrivals were affected by the delays. The heat is also causing headaches for travellers on Germany's highways. Since the high temperatures can cause concrete slabs on the roads to break, authorities have placed a speed limit of 80 kph (50 mph) on sections of the A7 and the A81 near the southern cities of Stuttgart and Ulm. Most homes, offices and schools in Germany do not have air conditioning. Under extreme heat situations, students and employees are sometimes allowed to leave work and school early to cool down as much as possible at home.